Sled Ride photo courtesy of Lamoreaux Civil. Mountain House project in resort community, designed by HOME ARCHITECTS ®. Multi-Family Housing, Mountain Retail, Convention & Meeting Facilities, Campgrounds, RV Parks, Marinas And other mountain-themed facilities that you may need. Our Mountain Resort Architects / Design Team has approximately 174 talented people to help make your resort a success. Each team member firm was hand-picked as having a specialty skill in related project types to provide you with the best possible services in this unique genre. Designed by Home Architects. (C)Copyright 2007-2014, Home Architect, PLLC, All Rights Reserved Worldwide. If you are looking for a team of mountain resort Architects and Engineers to create your mountain themed resort, that is what this team was created to do. Lead by Rand Soellner, ArCH, NCARB, Senior Staff Architect at HOME ARCHITECTS ®, the world’s leading mountain home architect, in association with Stephen Clack, AIA and David Jacobs, RA, our entire team of 174+ professionals in architecture and engineering is available to design your dream mountain resort. We created this group in response to developers who have called on HOME ARCHITECTS, who specializes in the design of custom luxury mountain projects, but who wanted much more than a house or a small group of residences. This Mountain Resort Design team has been created to satisfy the need developers have for $20 million, $50 million, $75 million, $100 million, $500 million and up resort designs. Rand Soellner was co-Project Manager on this high-rise condominium project in Charlotte, NC (now built and sold out). Rand was a licensed Architect at Omni at the time. There’s no “minium” about one of our multi-family units. We orient units to the best views available, and incorporate many of the features seen in our larger single family homes into condo and zero-lot-line homes. The idea is to make owners feel as if they own this piece of the sky and it is all theirs. Mixed Use High-Rise: Multi-family on higher levels, office in the middle sections, parking garage levels just above 3 levels of retail & restaurants. Orlando, Florida (Rand Soellner co-designed while at Catalyst) It should be noted that his company’s current work focuses on gable roof elements of more residential proportion, but this project indicates that his firm’s projects have no limits, if you are a developer and have in mind a large project. HOME ARCHITECTS ® & related design architects: we have been approached multiple times in the past by developers wanting us to offer not just our outstanding mountain house design services; they want entire villages, mid-rise, high-rise, marinas, themed retail, office buildings, resort master planning, condominiums and other aspects to create unique MOUNTAIN RESORT PROJECTS designed by a mountain resort architect. That is why we have established this unique team. Rand Soellner, ArCH/NCARB is the lead design architect for the association and architect of record for the project. Steve Clack, AIA/NCARB, worked together with Rand Soellner on about half of Jurassic Park in Orlando. Steve and Rand both worked as designers and architects at major condominium/multi-family architectural firms in previous decades, including award-winning projects that were highly successful for the developers. David Jacobs, RA is a good friend of Steve’s and worked with him on a number of projects and was brought into the team by Steve Clack, due to Mr. Jacobs’ thorough knowledge of multi-family and mid-rise projects and construction document experience. Above is one of the building elevations for a restaurant at Jurassic Park in Orlando, on which both Soellner and Clack worked. Rand is the architect of record on about half of the buildings there and Steve had a great deal of involvement in the design. This in part illustrates some the world-class resort work done by members of our team. These main mountain resort professionals pull together the entire team and insure that the proper Mountain Themed focus is maintained. Here is one of Steve Clack’s Site Analyses for a commercial project, evaluating how a building will relate to a lake, parking, housing units, pedestrian circulation and a mag-lev transport system. 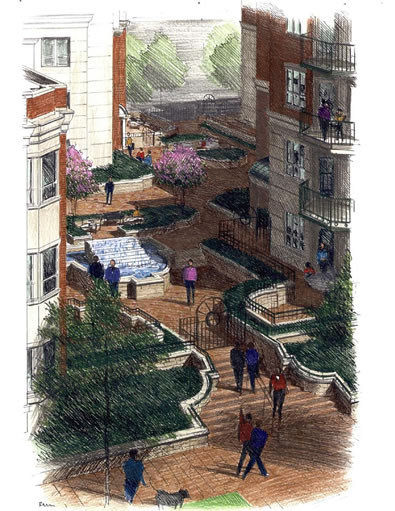 David Jacobs developed this project, the Townsend Mixed Use development, incorporating retail/restaurants on the first floor and living units on the upper levels. This type of architectural experience is critical to successfully developing Mixed Use projects, due the fire separation requirements, aesthetics, acoustical separation and scale of resort developments. Fullerton-Diaz Architects have joined our team in the role of production architects. Their expertise in mixed-use, mid-rise and high-rise condominium and office and high-end retail is among the best in the United States. With offices in Coral Gables (Miami) Florida, Abu Dhabi and Port of Spain (Woodbrook, Trinidad & Tobago), F/D is one of the premier architectural firms in this category in its own right. F/D is a large architectural firm, which is why Soellner selected them in this role, and quite frankly, Rand was surprised when they consented to work in this capacity, as they are successful on their own. Rand believes that the work that their company and Rand’s performed for a common client gave the two firms the opportunity to become familiar with each other’s work and design philosophies, which struck a common chord of excellence in architecture, which became the basis for the current venture. Monroe & Newell Structural Engineers are one of our featured proposed structural engineers. Their background in RESORT MOUNTAIN PROJECTS is one of the most focused we have ever seen for a specific engineering discipline. With offices in Vail, Denver and Frisco, Colorado, they are poised to handle projects in a variety of locations. They have a remarkable background in engineering structures for condominiums and other Mountain Resort facilities. Buildings to the right under this Monroe-Newell section were structurally engineered by Monroe-Newell and the building design was accomplished by others. 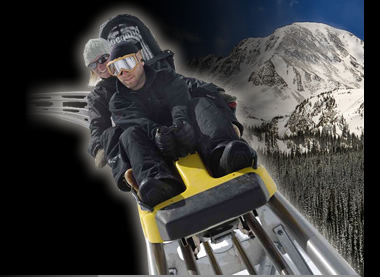 Monroe & Newell Engineers, Inc. has unparalleled current mountain and resort design. Their firm annually provides structural engineering services on more than $750 Million in construction costs. They have completed over sixty mountain lodges in the Rocky Mountains along with hundreds of other resort facilities across the Untied States. Monroe & Newell Engineers, Inc. approaches each project as unique and draws from the firm’s vast experience and expertise to provide the best structural system and detailing for each project. Based on their experience, they believe that truly successful projects can only be accomplished working in a team environment of owner, architect, and consultants from the beginning of the project. Because of the firm’s experience with resort construction they have a thorough understanding of the unique challenges and opportunities inherent in building in resorts. The decisions of wood versus steel, precast concrete versus cast-in-place concrete, spring start versus fall start, fast-track versus conventional design, bid versus negotiated have all been analyzed, discussed and answered many times. Working as a team to deliver the project successfully demands flexibility and commitment to the project by all members of the project team. Creating environments that are safe and exceptional. Monroe & Newell Engineers, Inc. offers the finest talent in structural engineering with unsurpassed resort experience. Lamoreaux Civil is our associated specialty civil engineering firm for resort rides and similar features. LM Civil, LLC, a Lamoreaux Group (LG) company, plans, designs and manages SPECIALTY CIVIL ENGINEERING types of projects focused on the specialty design of resort & recreational features such as Sport Climbing Walls, Amusement Park Rides, Roller Coasters, Sport parks and the civil aspects of Resort Condominiums & Lodges and Resort land Development Projects. Lamoreaux’s work is found throughout the USAand internationally. Lamoreaux has completed hundreds of projects since 1991. LG is a consulting associated firm, working as an integral part of our Resort Design Team. Additionally, LG provides planning, engineering, design/engineering oversight, project controls, CPM (Critical Path Method) Scheduling, contractor submittal review, construction design support, preparation of testing procedures and testing support. Lamoreaux has offices in San Jose, California and Cedar City, Utah. In the coming months, we will be adding more of our team member information. tags: mountain resort architects, design team, custom, park city, utah, denver, deep creek, la jolla, boulder, denver, santa monica, lake tahoe, california, deer valley, santa barbara, palo alto, austin, san mateo, san antonio, houston, Canada, boone, las vegas.